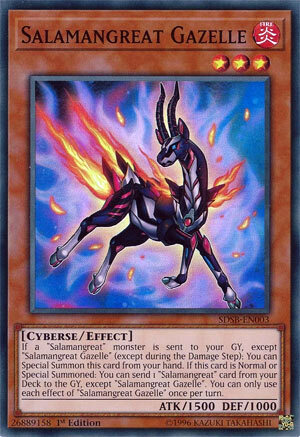 If a “Salamangreat” monster is sent to your GY, except “Salamangreat Gazelle” (except during the Damage Step): You can Special Summon this card from your hand. If this card is Normal or Special Summoned: You can send 1 “Salamangreat” card from your Deck to the GY, except “Salamangreat Gazelle”. You can only use each effect of “Salamangreat Gazelle” once per turn. No Fun for April Fool’s Day, aw Fooey. Salamangreat Gazelle should have a weakness for Magical Muskateers (hunter/prey joke). It’s a Level 3 Fire Cyberse-type monster with 1500 Atk and 1000 Def. The stats are good for Level 3 especially since UFO Turtle can get it out easily but 200 Def would have been best for Fire. While in the Hand, Gazelle Special Summons itself if a different Salamangreat is sent to your grave. Then upon that or any Special Summon or Normal Summon, you can send a different Salamangreat card from your deck to your grave. These effects can only be used once per turn, but they are free and set the deck up quite nicely. Most Salamangreat card can some out of the grave to be used that turn. The more Salamangreats on the field, the more Link options you have. Gazelle is definitely a there-of in the deck. As you can maybe tell, the purpose of last week was to give an introduction to the Salamangreat archetype before we looked at the Structure Deck support, so here we are now starting with one of the better cards in the deck, Salamangreat Gazelle. Gazelle is a Level 3 FIRE Cyberse with 1500 ATK and 1000 DEF. Stats are fine for a Level 3, FIRE is nice in the Salamangreat deck, and Cyberse is the same along with the generic support they get. If a Salamangreat monster is sent to the graveyard, except another Gazelle and except during the Damage Step, then you can Special Summon Gazelle from your hand. It’s easy to send a Salamangreat monster to the graveyard with a Link Summon, so this shouldn’t have an issue coming out. Other options could include a Salamangreat being destroyed, you discarding Spinny for his effect, or detaching a Salamangreat as a Xyz Material. You should have zero issue getting Gazelle out via this effect. If Gazelle is Normal or Special Summoned, you can send any Salamangreat card from your deck to the graveyard. This deck likes graveyard setup for a few reasons. You could send a themed Spell/Trap to the grave to grab it back with Sunlight Wolf with his effect if you Reincarnation Link Summoned it, you can put Jack Jaguar in the grave for his effect to Special Summon himself to a zone a Link Monster points to (probably Sunlight Wolf), or you can send Spinny to revive himself via his own effect, or just send any Salamangreat monster so when you Summon to a zone Sunlight Wolf points to, you can grab it back. Each effect of Gazelle is a hard once per turn, which is perfectly fine since he sets up plays and disruption. I know it’s heavily searchable in the deck, but it’s still a three of since it is so good for said deck since it gets things going for you. Art: 4/5 Cute little Gazelle. Here we are starting Salamangreat Week Part Deux! The Gazelle opens this week, being a Cyberese, Level 3, Fire Monster, with 1500 attack (not bad for a Level 3 at all) and 1000 defense. So, if a theme Monster is sent to the Graveyard (save during the Damage step) our Gazelle Special Summons itself from your Hand. Very good, and no restriction as to how the prior Monster goes to your Graveyard, from where, or by who. That makes the Special Summon of this card ludicrously simple. Furthermore, a Normal OR Special Summon of this card grants you a ditch of another theme card (excluding itself) from your Deck to the Graveyard, which only fuels the cycle and assists in countless plays and maneuvers this Deck can pull off. Being versatile and not restricted to your Normal Summon of this card is awesome, too. Each effect is, naturally, once per turn. This is one of, if not the most, necessary focal keys to this Deck for how fast it is and how much it can set up and pull off. Coupled with how easy it is to use and abuse in the theme, I’d be using three Gazelles in the Deck, regardless of how I happen to be playing it, because it’s going to help you that much. Art: 4/5 These metallic flaming animal pics are fun, and I do like the gazelle, as well as the bright flaming background too. Next articleDuel Power – What You Should Know / Yu-Gi-Oh!